At the Wargaming Corner, visitors get access to the most recent and up-to-date news regarding board games, miniatures, series, and other developments. The information found here is syndicated off many news blogs, resources, and outlets. We work with big-time bloggers in getting pertinent information straight to our visitors. 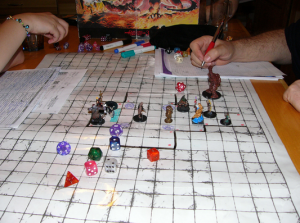 Wargaming is centered around the world of Role Playing games (RPG), board games, miniatures, scenery, and other types of social gaming experiences. The various games users can play number in the thousands, with some of the most popular series decades old. The games covered in WC news includes some of the most popular franchises in the industry, including the Warhammer 40k series and Dungeons & Dragons. We welcome both long-time players, fans, enthusiasts, or just casual observers to the wargaming community. We hope your stay at the WC is a fun, resourceful experience.